Travel around the world in a whirlwind adventure of international folk dance. 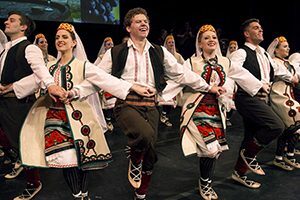 The Tamburitzans’ 82nd season show is a two-hour global journey of international music, song and dance with numerous cultural heritage legacies along the way. Your cultural journey may “visit”: Austria, Bulgaria, Croatia, Cuba, Eastern European Roma, Greece, Hungary, Mexico, Romania, Serbia, Slovakia, Slovenia, and Spain. Saturday, January 26 at 8:00 pm.